The woman pictured here, was about to check her blood glucose level. 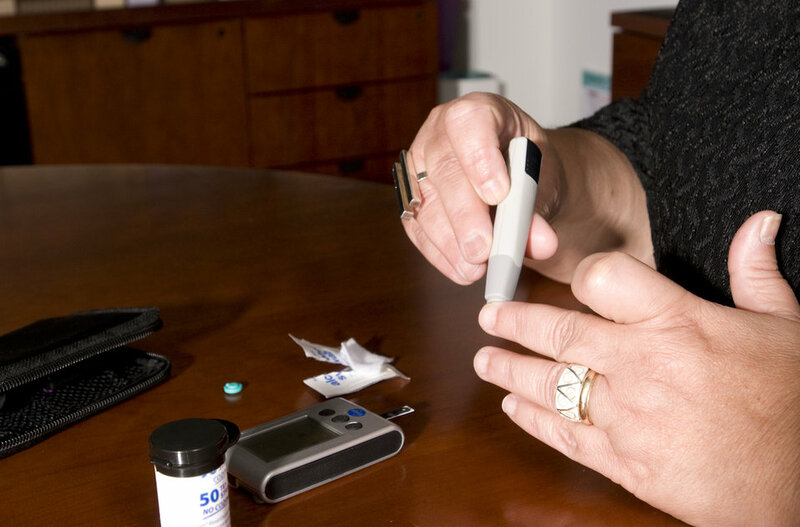 This process is known as self-monitoring blood glucose, and it's a way for people with diabetes to find out how much glucose is in their blood. A drop of blood from the fingertip is placed on a special coated strip of paper that 'reads' the amount of glucose in the blood. Many people use an electronic meter to get this reading. At this point, she was performing a controlled finger stick using a mechanized needle, which would very quickly, and relatively painlessly, penetrate the skin, thereby, inducing the delivery of a blood droplet, which could then be tested.